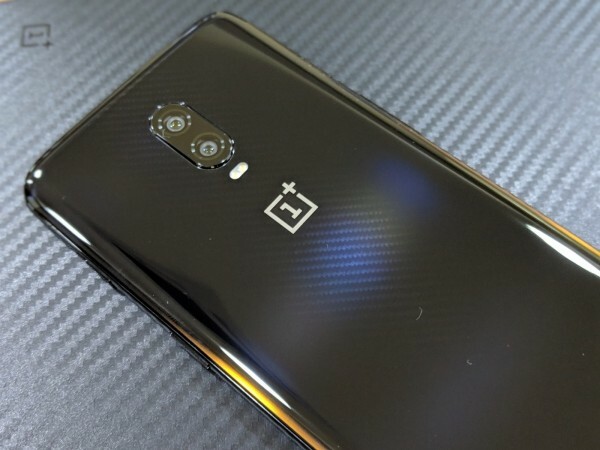 OnePlus 6T McLaren Edition has finally broken covers and it has the potential to be a total sell-out if OnePlus plays the cards right. OnePlus has ended 2018 on a really high note, making a greater impact on the mobile industry than it has throughout the year. By launching OnePlus 6T McLaren Edition, the Chinese smartphone maker has proven that it lives by the philosophy "Never Settle." OnePlus 6T McLaren Edition is this year's special variant in collaboration with another brand. 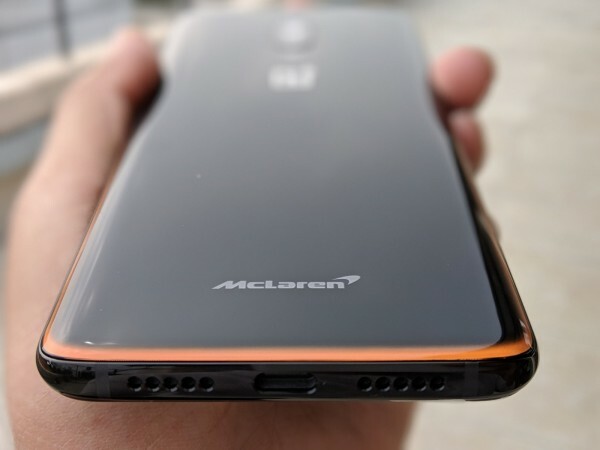 We've seen how the company has tapped on the trends by launching Star Wars edition and Marvel: Avengers edition phones in the past, but the McLaren partnership is one of its kind. In a true "salute to speed," which is at the core of both OnePlus and McLaren, the new smartphone sets some new benchmarks for flagships. OnePlus 6T McLaren Edition arrived at our office and I had the opportunity to unbox it earlier than the handset's launch in India on Wednesday. While the price of the OnePlus 6T McLaren Edition in India remains unknown, the international release suggests it will be well over Rs 50,000 mark, making it the most expensive OnePlus smartphone ever. With that mindset, I explored the OnePlus 6T McLaren Edition and here's what I found. For starters, let me talk about the unboxing experience. Every inch of the OnePlus 6T McLaren Edition's packaging spells premium and complements the overall theme. 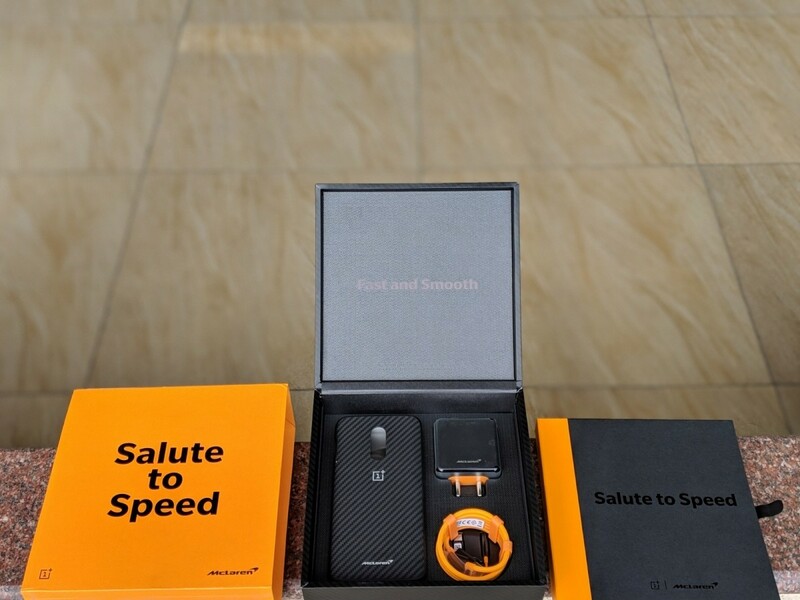 The black box with carbon fibre-like design slides out of a papaya orange cover that says "Salute to Speed" and has OnePlus and McLaren branding below. When I opened the box, which is like taking out a brand new Rolex out of its packaging, there's a book with "Never Settle" written on top of it. 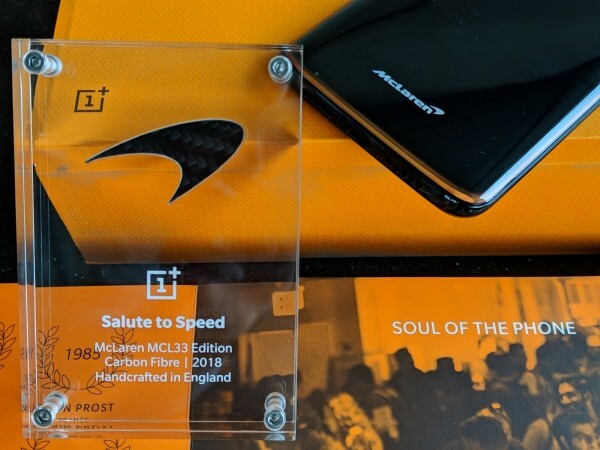 Below that, there are all the accessories, such as orange braided USB Type-C cable, black colour adaptor, a Type-C to 3.5mm connector, a Kevlar finish back cover and a memento that protects McLaren's iconic Speedmark made out of the same carbon fibre that was used in McLaren MCL33 F1 car. No phone? Well, OnePlus has a secret compartment inside the book, which talks (literally) briefly about the history of OnePlus and McLaren as brands. Roll over to the last page of the book and there lies the OnePlus 6T McLaren Edition in its black avatar. Picking up the phone doesn't really give you a different experience than the previous OnePlus 6T models as the company has gone with the same glass sandwich design. But the beauty lies in the details. OnePlus has a carbon fibre design underneath the mildly translucent back cover. The carbon fibre doesn't cover the entire back, but only the center part of the phone, which looks elegant. OnePlus chose the art of subtlety to adorn its McLaren Edition 6T by painting the bottom edge of the phone in McLaren's signature Papaya Orange hue. The company could've gone with painting the entire phone orange, but it made the right call to strike a balance between elegance and style. I wished the Alert Slider had an orange finish, but it would have disrupted the flow of the fading colour on the sides. From the phone's thickness to dimensions and placement of volume and power controls to the stereo grille and Type-C port, everything in the OnePlus 6T McLaren Edition remains unchanged. But as I booted the phone, there were some new changes that take the McLaren theme beyond the looks and feel of the phone. I noticed a special screen while the 6T was starting up, which also showed how the 10GB RAM could be put to better use through augmented reality. I'm planning to share more on this in a separate post, so stay tuned. 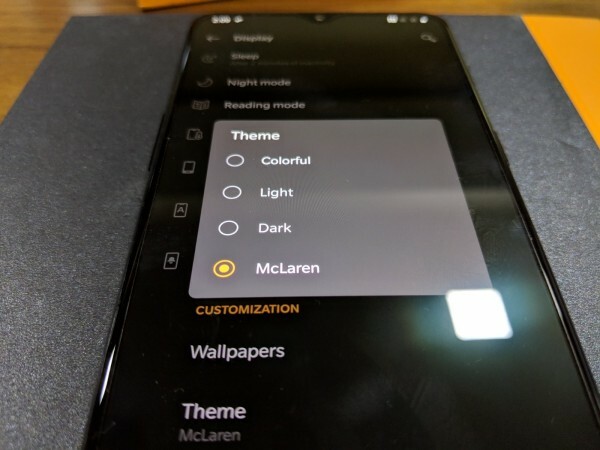 Moving further, the 6T McLaren Edition has a McLaren theme set by default, which is in addition to the light, dark and colourful themes. 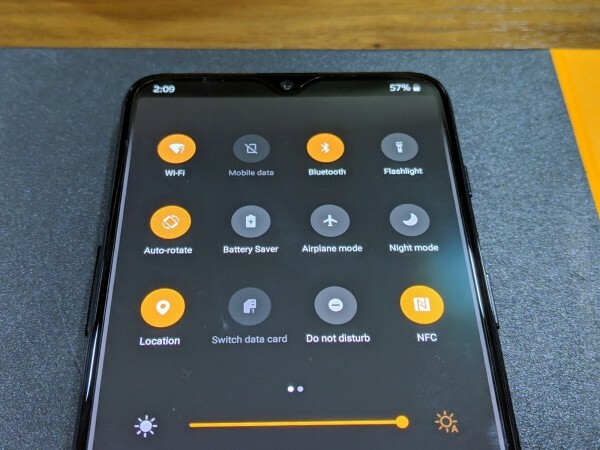 The pull-down notification area has orange icons, in line with McLaren theme, and so are the icons in settings and all the accents. There are a whole new bunch of wallpapers that only signify speed. As cool as they may be, OnePlus has not offered a single McLaren F1 car wallpaper, which would have been apt for the theme. Luckily, the power of Android lets you download any wallpaper you want. 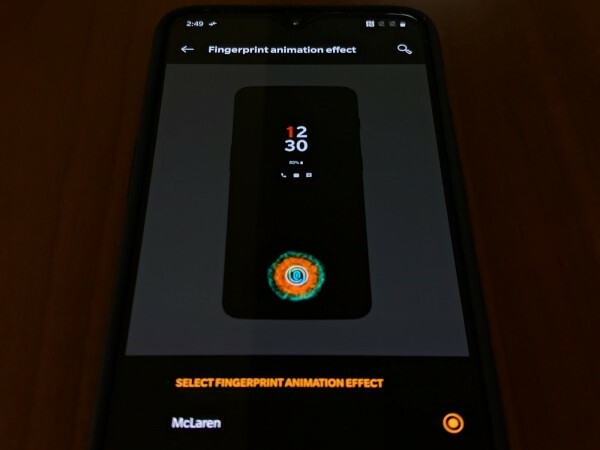 Finally, OnePlus 6T McLaren Edition has a new animation for unlocking the phone by using the in-display fingerprint scanner. This has to be the best theme integration of all. OnePlus 6T McLaren Edition is the first to come with 10GB RAM and Warp Charge 30, which we will be testing during our full review of the handset. 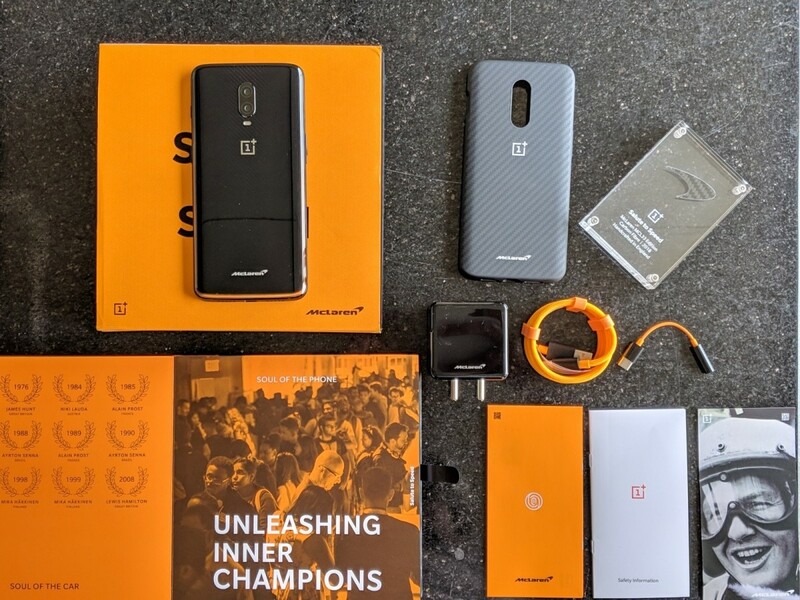 From my hands-on experience so far, if I have to pick a favourite special edition phone OnePlus has launched over the years, it is clearly the McLaren Edition.